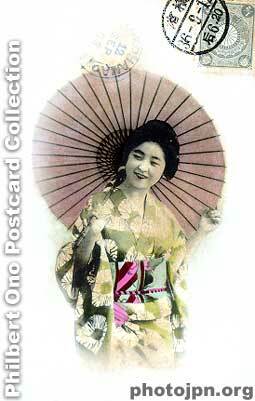 Laughing Geisha with umbrella. As you may have noticed, the umbrella (and fan) was a commonly used prop in tourist photos. Postmarked 1903 from Yokohama. The actual card is more yellowed and almost brown, but I bleached it with Photoshop. What an excellent collection you've gathered up on this site - a real pleasure for the viewer! best wishes to you.